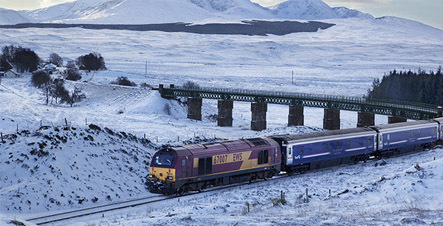 The West Highland line runs from Glasgow all the way to Fort William and Mallaig, passing through dramatic scenery. Considered by many to be one of the world's greatest train journeys, the West Highland Line is famous for taking Harry Potter to Hogwarts! Glasgow to Mallaig takes more than 5 hours, heading west over the iconic Glenfinnan Viaduct, plus views of Loch Shiel, Loch Eilt, Ben Nevis, and more. The tour includes a day trip on the Jacobite Steam Train. The Far North Lines connects Inverness with Thurso and Wick at the northern limits of the Highlands. The full journey takes approximately 4 hours, through hundreds of miles of beautiful varied landscapes, from peat-land bogs and tiny hamlets to the gates of the magnificent Dunrobin Castle. The Inverness to Kyle of Lochalsh route takes just 2.5 hours, but is another of the world’s most scenic rail journeys, including magnificent shorelines, wild mountain vistas, charming Highland villages, and hopefully sightings of local wildlife. 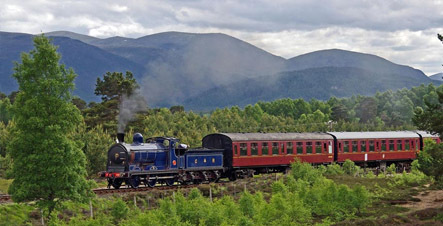 Travel in comfort to see the Cairngorm mountains on a vintage steam train trip. Ideal for kids, the 1.5 hour journey provides afternoon tea or a three-course Sunday lunch on board the train. Alternatively, disembark at Boat of Garten for the nearby RSPB reserve. From Glasgow Central Station through the south-west coast to Stranraer, this 2.5 hour journey passes by some of the Scotland's most famous golf courses and into the heart of Robert Burns country. You can also see the striking ruins of twelfth century Glenluce Abbey, and the sixteenth century Baltersan Castle. Offering a classic tour with four nights aboard, The Royal Scotsman is one of the finest luxury lines in the world,. The route takes passengers from the Southern Highlands up through the spectacular and remote wilderness of the Western Highlands, all while relaxing in luxury cabins with fine dining and 5-star hospitality, stopping off for day trips and distillery tours along the way.